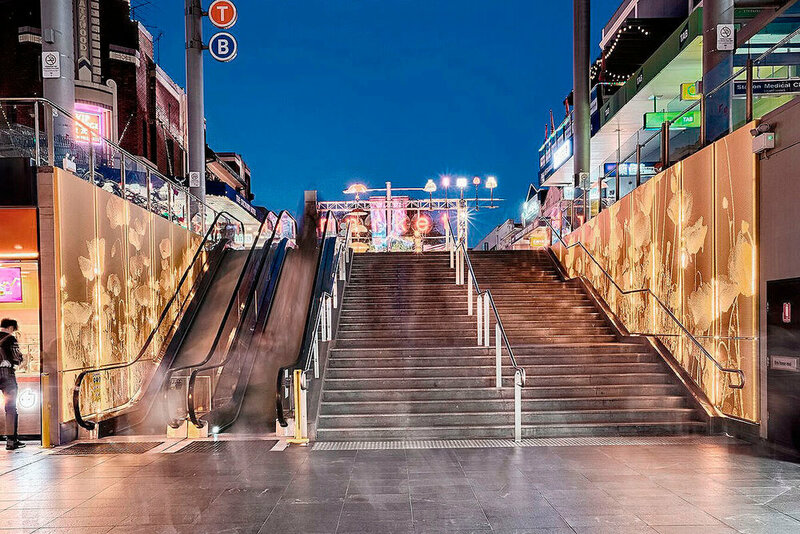 Chatswood Interchange is a vibrant modern transport, retail and dining hub that’s abuzz at all hours of the day. Di Emme worked with Buchan architects and Light Practice to create a series of decorative screens for the interchange entry points. The screens have a recurrent floral motif and support ‘way finding’ with their strategic placement at entrances, escalators and walkways. The aluminium panels, are perforated with floral images and finished in anodised gold. The panels are illuminated and appear to be backlit. Di Emme worked closely with Light Practice to achieve this effect; developing a printed backing panel that evenly spreads the side-lit LED lighting. R&D is integral to Di Emme’s practice. We work closely with architects, designers, lighting consultants and our clients to prototype and test designs, materials and techniques to bring their concepts into being.